Thumb and forefinger slots for increased comfort and less fatigue. Allows user to push through sheet metal with ease with less risk of cutting oneself. Serrated cutting edges prevent slippage when cutting. Less hand fatigue when cutting thicker materials. Design with compound leverage action. Torsion spring opens jaws automatically during cutting for faster cutting action and less fatigue work. Chrome plated rust protected forged blades for increased lifetime. Extra hardened to 65 HRC. Made from forged alloy steel for best durability – Cr Steel. Flush slimline design for non-snagging in material. Triple cutting direction identification – on the head, handle and by colour coded handle. Ergonomic and durable overmoulded grips add comfort and last longer. 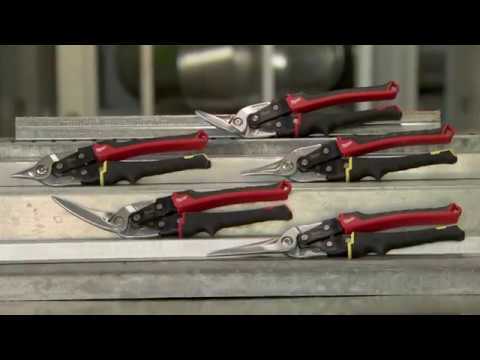 Aviation snips: For short, straight and shaped cuts. Ideal for narrow radius cuts and notch cuts. Offset snips: For long continuous straight or curved cuts. 45° offset keeps users hand away from the cutting material. Extra long aviation snips: For longer and straighter cuts in one go.